At least eleven soldiers have died and 55 have been wounded as the Libyan National Army (LNA) today appeared to begin its long-awaited attack on the remaining Benghazi militant enclaves of Sabri and Suq Al-Hout. The assault comes three years to the day since the then-retired general Khalifa Hafter launched his Karama (Dignity) operation against Islamist militants in the city. The LNA, made up of regular troops and Saiqa Special Forces is reported to have gained ground in Sabri despite the presences of a large number of mines and IEDs. These, along with accurate sniping, appear to have been responsible for a large number of the army’s casualties. 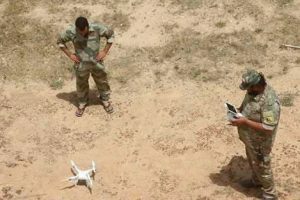 At least one Saiqa unit has been using a commercial drone to reconnoitre militant positions. Roads running from the front lines to Al-Jalaa hospital and Benghazi Medical Centre have been closed to allow the rapid evacuation of military wounded. There are no figures for militant dead and wounded. Given the eight weeks that it took Saiqa Special Forces to finally overrun a limited number of militants holed up in Ganfouda’s 12 Apartments, there must be real concerns that the battle to take well-prepared positions, particularly in Sabri, will be long and costly.